May 2016 marked the centenary of the murder of labor and socialist organizer James Connolly. We offer A Full Life: James Connolly The Irish Rebel, a graphic history of his life and legacy, on our products page. The 2019 Solidarity Forever Labor History calendar marks workers struggles against fascism and bigotry, and the long history of workers organizing in the face of repression and attempts to divide us. Although the centenary is over, we continue to offer Joe Hill t-shirts (only some sizes remain), a book of Joe Hill’s collected writings, recordings of his songs by Fred Alpi, the Shelby Bottom Duo, and Bucky Halker, etc., and to add new Joe Hill events to our calendar (and to notify site subscribers) as we learn of them. The only public memorial in the United States to this legendary organizer and songwriter was unveiled in January 2017. 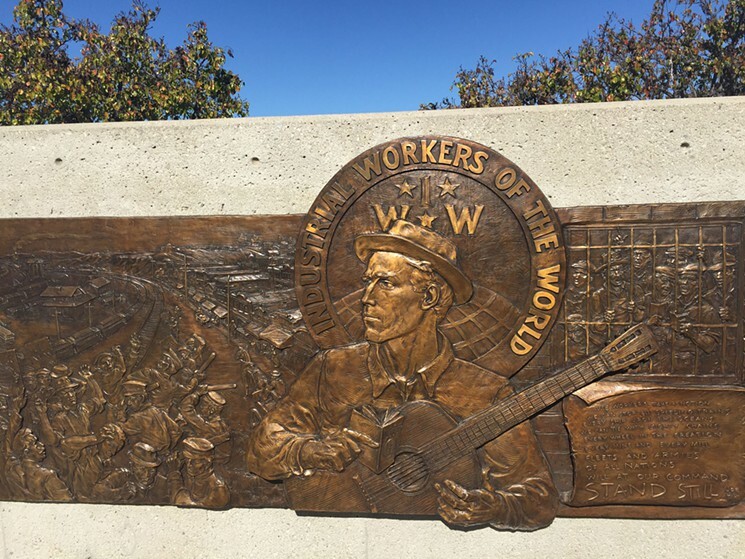 The 8-foot-wide plaque features Hill holding a guitar, with the IWW’s universal label over his head. His gaze is fixed on a sea of San Pedro workers confronted by policemen, their batons raised. 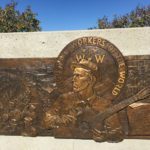 ILWU members, Wobblies and others were present for the unveiling. Joe Hill was secretary of the San Pedro dockworkers’ strike committee, and lived there for several years before the blacklist sent him to Utah. November 2015 marked the centenary of the judicial murder of IWW organizer and songwriter Joe Hill. 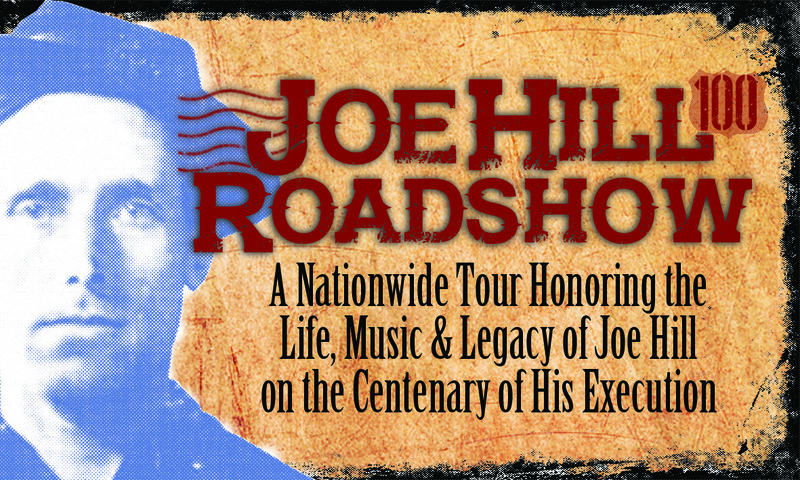 This site features information on Joe Hill’s life, a calendar listing events around the world marking the centenary, the text of all of Joe Hill’s surviving songs (with links to the music and selected performances), and other material. Suggestions for additional material are welcome. Hello , as you already know, ” ApARTe°”-irregular materials of libertarian culture – is working on a book on Joe Hill’s life and murder. The book on Joe Hill will have about 120/132 pages in black & white and 12 more four-color . It will be in three languages (Italian , Swedish and English) , as were many flyers IWW . Its format will be 22x22cm. Along with the book there’ll be a CD ” Non dimenticherò mai Joe Hill / Never forget Joe Hill / Aldrig Glomma Joe Hill” to which almost one hundred of international artists have taken part. In addition to this, we’ll insert a booklet of a play by Upton Sinclair, “Singing Jail Birds”. Here in Italy there’s already great expectation for this book; they talked about this release at the important Premio Tenco in Sanremo 2014. Great way to pay tribute to Joe Hill! “Glöm aldrig Joe Hill”. The title listed (“Aldrig Glomma Joe Hill”) is not Swedish, either in construction or spelling. I read some of the articles about the Joe Hill Centenary in the recent issues of the Industrial Worker yesterday. Thanks… good journalism and IWW writing there. I heard that Joe Hill’s ashes were sprinkled in the guitars of IWWs. That IWW musicians lined up with their instruments, guitars, violins, a cello, banged a couple songs out, and then utah sprinkled ashes into the instruments. Are there more of Joe Hill’s ashes that can be distributed in this way? Can we recycle dust from instruments that have already been anointed in this way to christen more IWW instruments??? that would be nice. The story was about Bruce “Utah” Phillips. Duncan Phillips, his son, said; His songs and his stories were more or less my inheritance. That, and an old curly-top maple Guild guitar, which still carries some of the activist Joe Hill’s ashes. 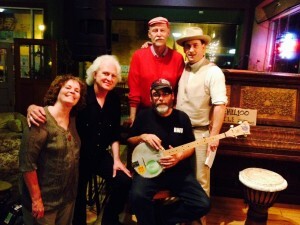 Looking forward to Joe Hill concert tonight in San Francisco as part of Labor Fest 2015. Also I’ve just written a biography of the Oregon delegate, Marie Equi, who was asked to disperse Joe Hill’s ashes. She was a medical doctor and did not qualify to become a regular IWW member but the local in Portland made her an honorary member. She also lived with Elizabeth Gurley Flynn in Portland, OR on and off for nine years. MARIE EQUI: Radical Politics & Outlaw Passions by Michael Helquist, to be released Sept 15, 2015 by Oregon State University Press. Thank you much for doing this!!! Gene Debs, and Lucy Parsons. I was in the audience at the Joe Hill concert last night at the Old Socialist Labor Hall. My ears are still echoing with all the great music. Thanks so much. One suggestion, however: Please try to incorporate some music and commentary about the contemporary class and other struggles like Occupy Wall Street and BlackLivesMatter. (Don’t get caught flatfooted on the latter like Bernie did in Phoenix.) There are still revolutionary socialists and anarchists trying to make history and bring down the System. We are not just historical items for nostalgia! Thanks for your comment. Wasn’t at the Barre show, but I do know that in Philadelphia there was a dedication (with fairly extensive commentary) of one song to Sandra Bland, and another to Freddie Gray (noting that they had done the same in the Baltimore show the night before). And Charlie King did a song, “Bring Back the 8-Hour Day,” that explicitly connects the current decline in working conditions to the struggles of 100 (and 125) years ago. Surely “Dump the Bosses Off Your Back,” “Solidarity Forever,” “The Banks Are Made of Marble” (explicitly discussed in terms of recent events in Philly) and “There is Power” (all part of the set list in Philadelphia) speak as much to current conditions as to historical ones. On September 5, 2015 there will be a party and concert for Joe Hill at Sugar House Park, in Salt lake City. This is the site of the old Utah State Prison, where he was murdered in 1915 by firing squad. Where exactly in the park will this event take place? It’s a big park. Where do we enter the park from by car to get to the site? Utah Phillips received Joe Hill’s ashes from me when i was the office manager for the Western Montana IWW GMB back in the ’80’s. A couple of pinches of Joe’s remains also reside in my guitar (which also has IWW in mother-of-pearl on the headstock). Mark, there is also a photo on the Reuther Library site of Utah Phillips at the National Archives in Washington, D.C., in 1988. Caption; Utah Phillips receives Joe Hill’s Ashes from Trudy Peterson while Fred Lee watches at the National Archives. Dr. Marie Equi, a radical lesbian doctor and activist, received Joe Hill’s ashes on behalf of Oregon. She was a close, supportive colleague of Elizabeth Gurley Flynn when the latter was trying to intercede on Hill’s behalf with President Wilson and many others. Equi’s full biography now available for the first time: “MARIE EQUI: Radical Politics & Outlaw Passions,” order through indie bookstores or at familiar online book sources. Utah called me when I was running the Wob office in Missoula to ask if FW Art Nurse could fund his quick trip to D.C from Saratoga Springs NY where he would be playing that weekend. FW Nurse ponied up the cash to fly Phillips to Washington so he could be there for the ceremony. I’ve just completed a Youtube video to mark 100th anniversary of Joe Hills’s execution at Salt Lake City, next Thursday, November 19th, which you may wish to watch and circulate.